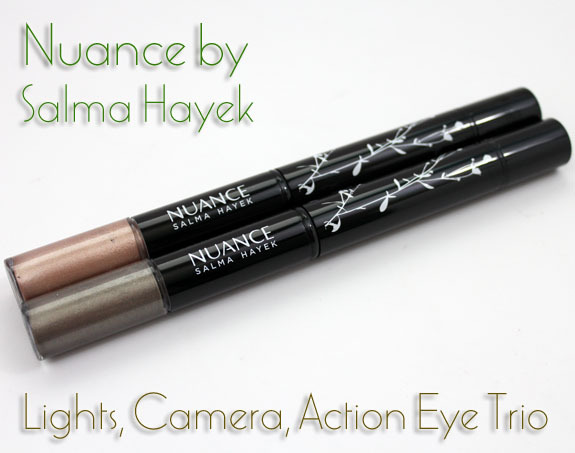 Nuance by Salma Hayek has some pretty nifty offerings, but this may be one of the coolest yet! These are called Lights, Camera, Action Eye Trios. They come in four shades and in a very cool looking “wand”. 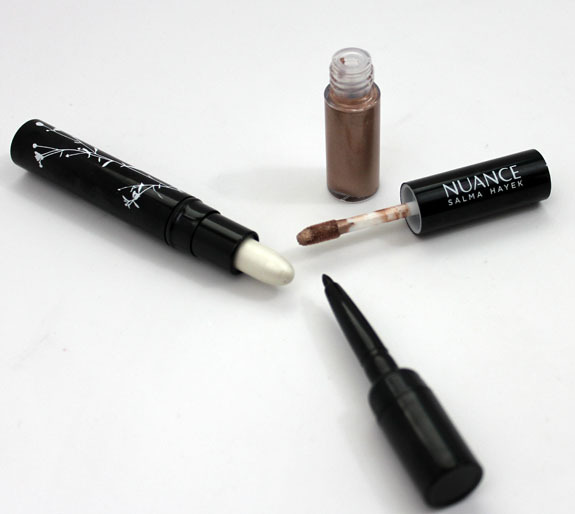 Each wand contains a creamy eyeshadow, highlighter and eyeliner hidden away! Once you take it all apart, you have four separate components that make up the wand. The cream shadow is on one end. You open that to reveal the sponge applicator for it. In the middle of the wand is the highlighter stick, and when you pop the other end off, you get the eyeliner! The highlighter stick is a little different than anything I have used before. It’s like a waxy stick. It wasn’t too hard or difficult to get good payoff though. Definitely a no mess solution! The eyeliner is a nice jet black. The highlighter stick is a shimmery pale gold color. 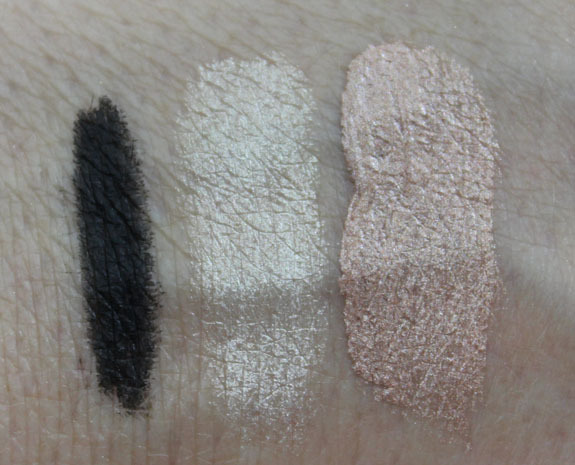 The cream shadow is a very pretty pale bronze color. 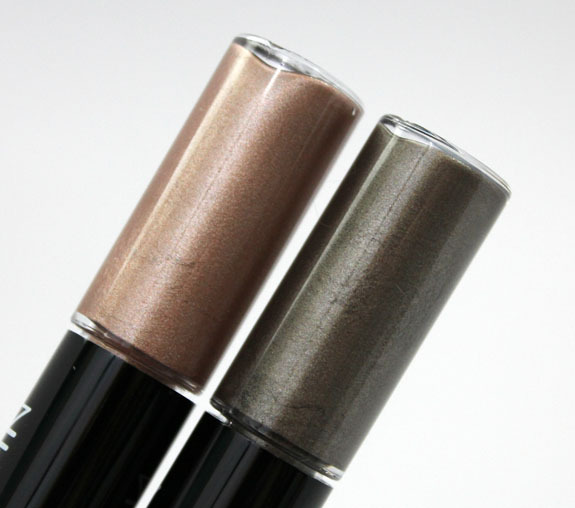 The cream shadow is a greyish/green/silver color. I really like the convenience of having all three of these items in one simple to carry wand. They would be totally perfect for traveling as they feel sturdy and contain a small amount, but enough of everything you would need. 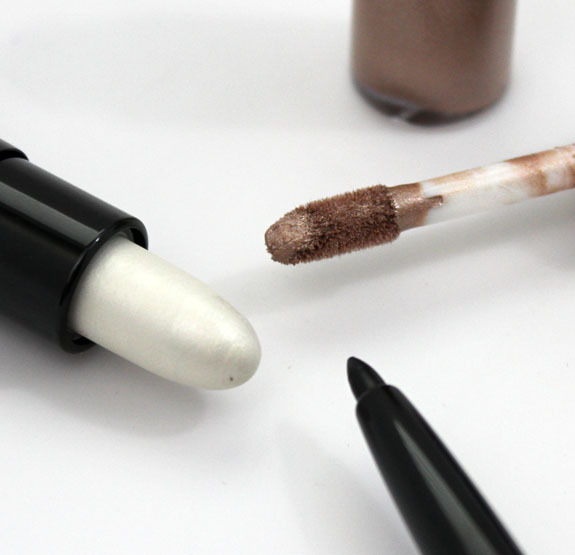 Do you ever purchase these types of all-in-one makeup products, or do you prefer separates? I really like these! Any chance you could do a look with one of them to show it off? I’ll have to keep an eye out the next time I’m at CVS! I like how they packaged it. I might have to try one. Wow, those look great for travel! Not like I ever go anywhere, but that doesn’t stop me from wanting them, haha. I bought two of those and need to wear them. I like seeing your swatches. I think these will be awesome stocking stuffers for my younger girl cousins. They’re just getting into makeup! Very interesting concept. And the color selection doesn’t seem off the wall either. 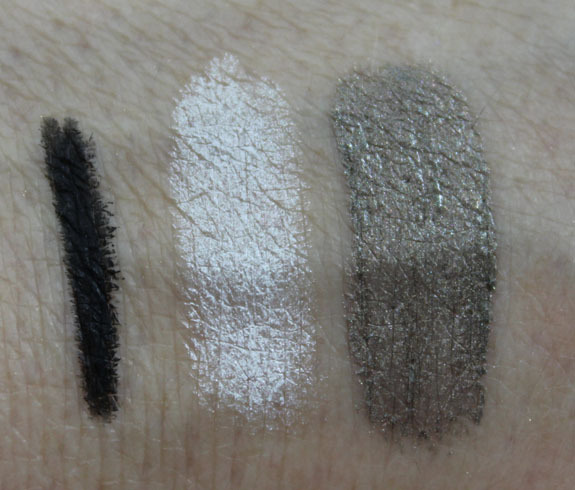 I wish that the liner with the bronze combo was a dark brown, that seems like it would be less harsh. 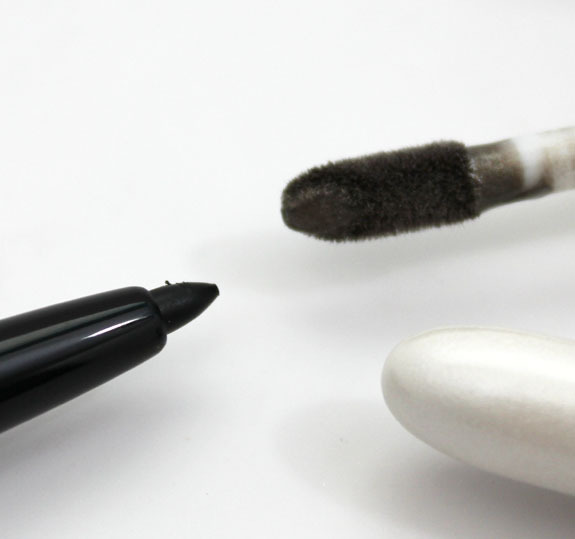 But it IS a gorgeous black, and a great product to throw in your bag for touchups. How did the cream eyeshadow hold up? I’ve never had a good experience with one. They alwaaays seem to crease on me. I like the efficient packaging – makes it easy to travel with and it just generally takes up less space. Like Isabel, I’m also curious about the cream eye shadow. Did it crease on its own? Did it not crease when used in conjunction with a primer? You’re lucky to last even 1 hour without a primer. I’ve had some cream shadows crease literally 10 minutes after I put them on because my eyelids are oily, I guess. Well yes if it’s a cream shadow it will crease on me that fast also without a primer. If it’s powder usually around an hour. Primer is THE best invention ever! Did you set it with a corresponding powder eye shadow shade? Thanks for replying! Sure! Nope I just tried it on it’s own but you certainly can use a powder with it. love the idea of this for my travel bag! These really look like a wonderful idea. How is it using the eyeliner? It’s such a short little thing! I would also like some other colors of liner with the shadows. I also would love to see you do an eye makeup look with this. Please? I have this in champagne. 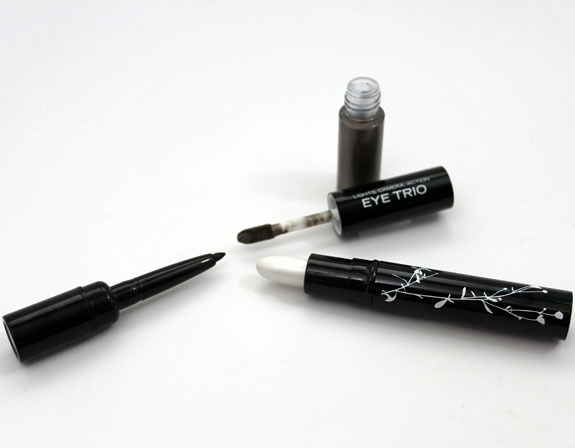 I’ve used it several times now (with primer) and it doesn’t crease on me, the liner is nice and goes on nice and smoothly with no tugging and it stays put. The item I’m least crazy about is the highlighter, it’s too big for inner eye work and is a little too white for my liking. I like the look of that shimmery gold one you bought. I could see this being super convenient for travel or staying with friends. Plus I wouldn’t worry about losing it since it’s not overpriced. The pewter shade is lovely! I do travel a lot, so…yay, an excuse! The packaging on her stuff is pretty great. I also have had no luck with cream shadows, but based on your review & the comments, I think at least one of these is worth a shot.